This article covers the interface for adding caption files to videos as well as the workflow involved. To get started with captions choose the “Closed Captions” button on the dashboard. If you have never uploaded a .vtt caption file before, this tab will be empty. Click “Add captions" to upload your first caption file. 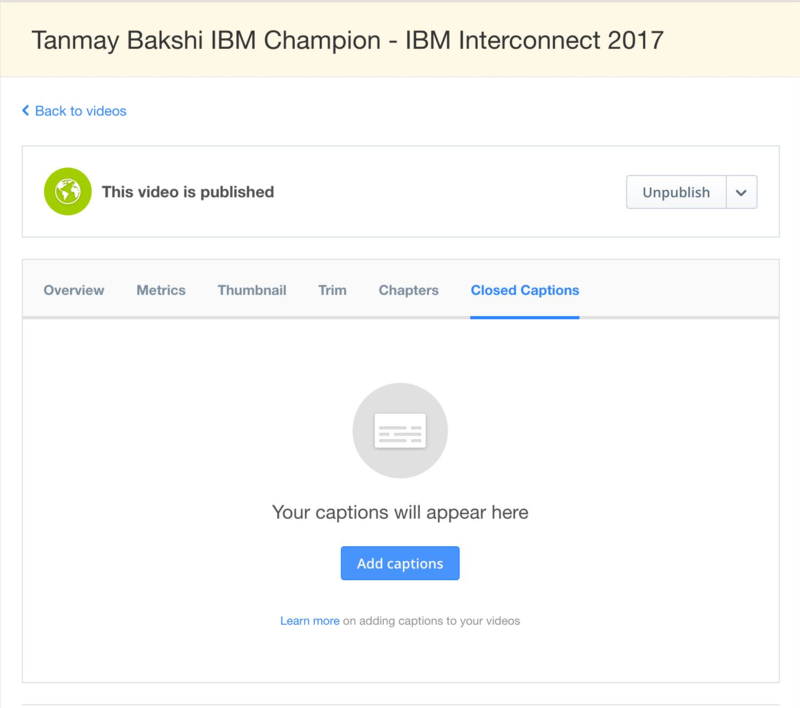 Note: Please ensure that your caption file has been correctly edited before uploading, as currently only IBM Watson Auto Generated Captions can be edited in the Dashboard. In case your video has live embedded (608/708) captions you will already see “English (live)” as the first element of the caption list. These live captions have been processed and converted into standard (.vtt) file so they will function just like any other uploaded captions. As a first step, you will select from a predetermined list of languages from a dropdown menu. You will find 180+ different languages and some variations of them (e.g. English UK, English US). Note: If you have previously uploaded captions in the selected language new captions are going to overwrite them. You can set these captions to appear on the player by default. In this case they will be displayed immediately as soon as playback starts without any additional settings. Uploaded captions will need to be processed. This process might takes a while. When they are ready we will send a notification to the email address you provided. This input field contains the email address you used the last time. Feel free to change it. If you don’t edit it at all, it will contain the channel owner's email. When all the necessary settings have been made click “Upload”. You will see your first captions being processed. Processing: Right after uploading, processing captions can take several minutes. Published: Processed captions will be automatically published. Unpublished: If you want to disable one of your captions you can unpublish them. They will be no longer available for your viewers. Only one set of captions can be set as default. You can replace the default captions with another one in the captions settings. See what you can do with uploaded captions by hovering your mouse over it. Download: You can download the processed WebVTT file. Settings: Change the language that was originally set up when uploading, or set these captions as default. Web Video Text Tracks is a standard for displaying timed text in connection with the HTML5 element. You might have captions in a different format e.g.Web SRT (.srt). In this case you’ll get the following error message. 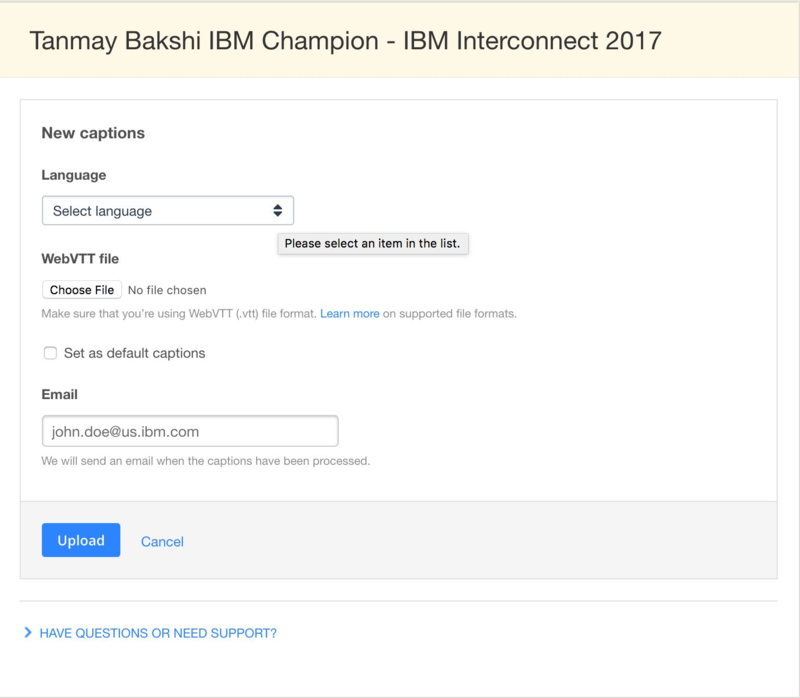 All you need to do is converting your caption file into a WebVTT format to be able to upload it. SMI and DFXP file formats are also supported for uploading caption files. Please contact us if you would like us to support any other closed caption file format. The text file you want to upload might contain special formatting. The player only supports positioning and basic formatting such as <b>, <i>, <u>. Formatting info other than this will be omitted. There is currently a 1MB maximum file size. If your upload is failing, please make sure that your .vtt file is a maximum of 1Mb.